DAVE SHIRLEY PHOTOGRAPHY "THE DIGITAL ART DESIGN STUDIO" 1410 South Jennings Ave - Lanett, Alabama - 334-642-3283(Across from Lanett Kroger and Next to Lanett CVS Pharmacy at Highway 29 & 50) DAVE SHIRLEY PHOTOGRAPHY offers all kinds of photography: high school seniors, children, babies, family, couples, engagments, indviduals, glamour, commercial photography. Don't see your style of photography well contact Dave and tell him what you have in mind and he can do it for you. DAVE SHIRLEY PHOTOGRAPHY is excited about being able to produce your High School Senior Portraits. We want to capture your personality - from the conservative to the wild and crazy. Dave is a member of Seniors Photographers International and continues to study with the greatest High School Senior Portrait Artists every year, so he can offer you "THE LATEST" in portraiture which your school's photographer CANNOT offer! Don't be disappointed in your Senior Portraits. You can not be told that you have to purchase from your school's photographer, you DO have a choice! Our Studio wants you to have the options of different looks, so you will be photographed in both formal and fun portraits. We want to capture your personality - both the jeans and casual side along with the more reserved look - traditionally sought by your parents - for these milestone portraits. You can select any portrait session to fit your style and budget! You can select to be photographed against several backgrounds and with more than one outfit to wear for each background. In this way, you will have a wide range of portrait styles. The GRAND & ROYAL SESSIONS are our most popular, but when you book the SUPER SUPREME SESSION, the choices are endless! 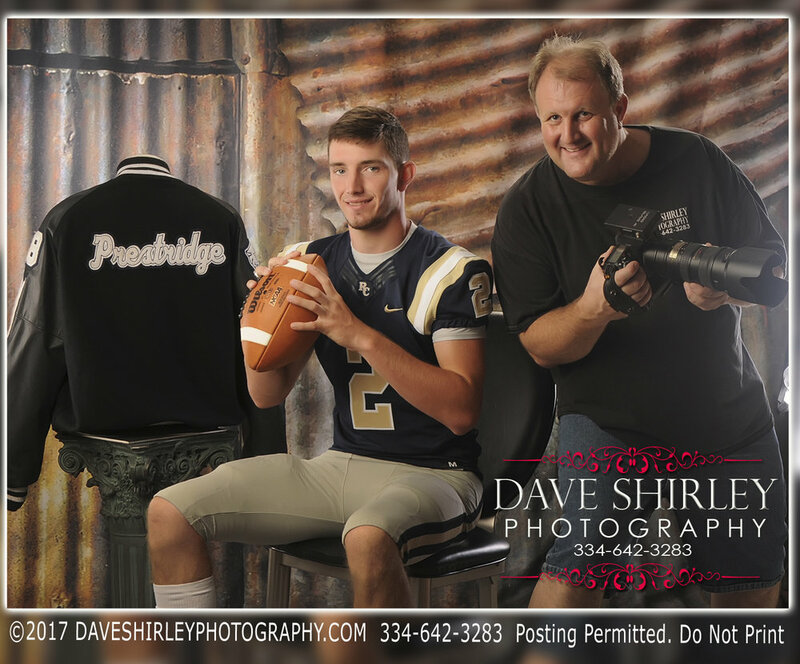 Meet Dave Shirley The Photographer Call 334-642-3283 to set up an appointment with the studio. Dave Shirley owner of Dave Shirley Photography Studio is a Professional Photography. Dave received his degree in Professional Photography in 1991 from North Ga. Tech. He studies and attends each year at Senior Photographers International, SYNC and Professional Photographers of America Imaging USA. Dave has spoken and teaches to many professional photographers groups, conventions to hundreds of photographers. If you would like to hire Dave to speak to your professional photographers group please call him at 334-642-3283. In May 2000 Lisa married Dave and joined the photography team. In the above photo is Dave and Lisa as Lisa graduated from college. Lisa is from Kanas and she was working for a travel agent and met Dave at a bridal show which he and she had a booths set up. Dave Shirley Photography Studio offers many professional photography needs. Here are just a few that we offer. We Photograph High School Seniors, Children, Babies, Children, Families, Teens, Couples, Pets, Glamour, Boudoir, Maternity, On Location, Business Portraits, Commercial Photography and If you did not see a listing of your needs please call us at 334-642-3283.